If you combine moe and tsundere girls with mecha sci-fi and some unknown alien force then you will get Sky Girls. From the title you probably could guess what this anime is all about. After watching the anime, I noted that most of the anime were more slice of life comedy than actual action/fighting against Worms. The story starts off as three girls are recruited into the Sonic Diver team with no experience at all. As episodes pass, you watch them gradually train and overcome problems to become efficient pilots of their chosen mechas. Most of the action in the early episodes would be watching the girls train in their simulators as well as having disagreements with each other. The actual action you get to see against the Worms starts around halfway of the series. The story wasn't too bad and it was quite straightforward and predictable. Perhaps this anime is more suited for the teenage girl or the otaku-moe guy. The art was simply amazing. 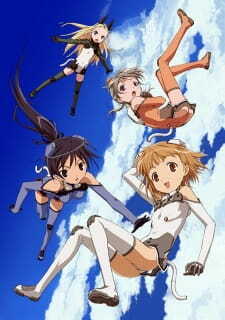 Every moment of the anime shows three girls in their awesome Pilot Suits which somehow resembles a neko (ears and tail). Jokes. The background scenery was great and the Worms looked like extremely large animals. The characters looked cute and had fine detail on them. The Sonic Divers looked unique but rather weak as if it can be easily crushed under some heavy weight. The girls are totally exposed whilst riding on the mechas so I can't say that I really like or dislike them. The 'Vic Vipers' looked like your standard jet fighter plane with additional weapons attached. I must say though, if this anime is set in 2086, why hasn't the technology drastically improved!? I still see cars with tired on the road, normal roadsigns, no interactive glass windows, standard mobile phones, and regular computers. Disappointing! I felt that this anime was set in the 2000s than in the 2080s. The theme songs were decent and was appropriate for the anime. Voice acting was great and I noticed some of my favourite voice actors were in there as well. Sound effects were decent and the overall sound quality was good. The anime focuses on the girls and Worms. All other characters were rather minor or there as support. The first girl you meet is Sakurano Otoha. The mysterious main character that has encountered a Worm in the past but had not realized it. She trains hard to become an efficient Sonic Diver pilot along with the other girls. She is the cheerful and optimistic girl of the group. Next comes Sonomiya Karen, the quiet and intelligent girl of the group. Her main task is to calculate attacks of the Worms whilst in combat. Ichijo Eika is a proficient Sonic Diver pilot that leads the girls. She is a total tsundere which makes it even better! Lastly, Elise von Dietrich joins the group determined to exact revenge on the Worms because of what it did to her home base. After a while, she shows signs of change as she learns from the other girls. She is a tsundere as well. There you have it, the Sky Girls team. Quite a varied bunch in personality and styles. Perfect for the anime. Overall, it was quite enjoyable as any other shoujo anime with some added sc-fi mecha action. I found that the anime solely focused on the slice of life elements of the girls rather than the issues of the Worm invasion. If you are in it only for the action they you may be slightly disappointed. Rather, this is more conceptualised as a journey of friendship and truth with friends whom you meet along the way. It is a nice story with some comedic elements in it. This anime would be more suited for the shoujo genreor the otaku-moe guy. Some depth in the story regarding the Worms but nothing that will confuse you. Loved the Pilot Suits. The art was detailed and the Worms looked quite original. The girls were entertaining and the mechas were decent. It was fun to get hyped over girls in Pilot Suits flying mechas.